Nestled in the rolling hills of Iowa in the northern region of Buena Vista County is the affluent community of Sioux Rapids. Sioux Rapids has a growing population of about 800 residents and an area of .82 square miles making it a close-knit and friendly neighborhood where families, couples, and individuals are all welcome. In conjunction with its beautiful location, Sioux Rapids is also surrounded by several other thriving communities like Linn Grove to the west, Rembrandt to the south, Marathon to the east, and Webb to the northeast. In addition to its eclectic surrounding areas, Sioux Rapids also has a rich history that dates back to the 1800’s when the town was first incorporated. In addition to its interesting background, Sioux Rapids is not far from another community that is very similar in size and population and only about a 20-minute drive, the neighborhood of Albert City. Albert City is located about 13 miles southeast of Sioux Rapids in Buena Vista County and holds a population of around 700 residents and is contained in an area of about 346 acres. Albert City and Sioux Rapids are similar in their landscapes as well both with rolling hills and nearby bodies of water. Residents of both Sioux Rapids and Albert City enjoy similar amenities like beautiful area parks, strong schools, nearby shopping districts, and delicious local restaurants. Those looking for a place to relax and enjoy nature can visit any one of the following recreational areas in the Sioux Rapids-Albert City area; Gabrielson Park, the Little Sioux Gol f& Country Club, or the Albert City Schools for extensive walking areas and clean picnic spots. In addition to its array of pristine parks, this unique region also provides residents with great educational facilities including Sioux Central and Albert City-Truesdale Elementary School. Families not only take full advantage of the excellent educational systems in Sioux Rapids and Albert City, but they also enjoy local restaurants like the Twisted Spoon Cafe and Wagon Wheel offering satisfying burgers, and other American dishes. After getting your fill at some of the local eateries why not walk off some of those calories in the unique variety of shops that are offered in Albert City and Sioux Rapids like Klutch Trends, Classy Boutique, and Maurice’s. With all of these exciting amenities, it's hard to believe why anyone wouldn’t want to buy a home here. Homes for sale in Sioux Rapids and Albert City are very affordable and come in architectural styles like Traditional single family homes, single story ranch homes, or mobile homes. Typically homes in these two regions include large yards, private driveways, and well-maintained interiors. 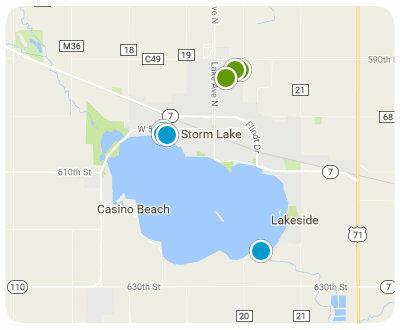 Prices for homes in Albert City and Sioux Rapids vary depending on location, size, style, and special features. Come join the friendly Iowa community and experience what living in a small town is all about. If you would like more information about the homes for sale in Sioux Rapids or Albert City, Iowa, please don’t hesitate to contact us today!